Our absolute favorite toy which you can find at kiddie parties and hopefully some fun adult ones:)! We are not at liberty to tell you directly about the concept you see- hence the roundabout description…! Cans: 3500- hugely diff from the 15,000 this team had last year. USP: structure is organic compared to last year’s entry, organic food, crab meat cans that make up the large part if the structure and use of twine instead of suspension bridge grade cable ! 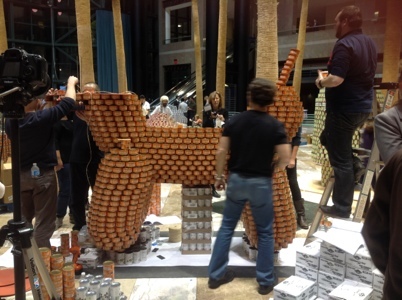 This entry was posted in Design, LIVE!, Out and About and tagged Canstruction by Pollyanna. Bookmark the permalink.